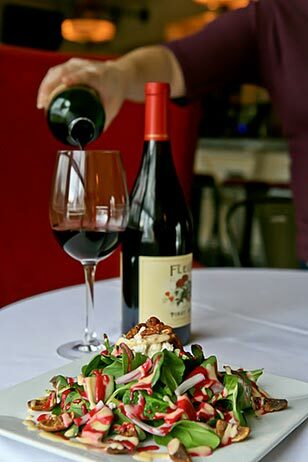 Wine and dine our treat at Chester County’s very charming and popular restaurant…The Gables at Chadds Ford! The Gables returns to Spring Main Line Restaurant Week this season with discounted, prix fixe lunch and dinner menus. This giveaway is now closed. Congratulations to our winner Mike V. Thank you to everyone who participated. The Gables at Chadds Ford, established in 1997, is situated in the heart of the historic Brandywine Valley. Located in a converted 1800′s dairy barn, the setting is simple yet elegant. The menu offers a contemporary twist on traditional American cuisine, utilizing French influences. The Gables at Chadds Ford combines an upbeat and comfortable ambiance with a creative and well executed menu. If you are looking for the most perfect, romantic place to enjoy Valentine’s Day this year, The Gables is an excellent choice! Now one lucky AroundMainLine.com foodie will be treated to an outstanding experience at The Gables with a $100 gift certificate in hand! Leave us a comment by noon on Saturday, February 9th, 2013. A winner will be drawn randomly after the close of the giveaway with the help of random.org! My husband and I would love to win and have dinner at the Gables. Love the food and setting at the Gables! Amazing food and beautiful ambiance! A great Valentine’s Day surprise! This would be an amazing evening with an intimate setting! How romantic! Love the idea and would love to try the amazing food! oooh…I hope I win…it might even make me like V-Day!! I would be so grateful and happy to win.Thanks. Brunch at the Gables is always delicious. I would love to go here! We have never been and I would love to take my BF for an amazing meal! One of my favorite places!! Can’t wait for the winery run in may!! The food and the drinks at the Gables are awesome. And the staff is always very friendly. Cant wait until May my daughter is getting married here. LOVE TO THIS PRIZE !!!! Love this place and would love to go back for dinner again soon! I would love, love, love to win! :) This place looks amazing. I would love to visit Chadds Ford, it has been so long, and the hus and I could use the recharge time! Would love to try this place! It looks very charming. Would love to try this restaurant out! I’ve always liked The Gables. Pick me, please! This would be a great V-Day present!!! I would like to try chadds ford! My family and I love this place and would love to go back again to celebrate my dad’s birthday! Ironic – ever since I read an article about this place, I’ve been wanting to take my love there to dine. My husband and I enjoyed a delicious Valentine’s Day dinner two years ago at The Gables. We’d love to win the gift certificate for a chance to return. Would love to try this place!!! The most romantic place that I have ever been. Would like to go back on Valentine’s day! We frequently visit Longwood Gardens…think that this nearby destination would be a great place to top off the evening. Just drove by this restaurant and it looks great. Would love to win this!! Yum! Never been there, but would love to give it a try. Tried The Gables during Restaurant Week and loved it! Appreciate the chance to win a gift certificate. Thank you! Had a delicious lunch at Gables. Looking forward to dinner and sunset. With 3 kids being sick on and off all winter, my dear hubby and I sure could use an evening out at the Gables! It is such a cozy, quaint, beautiful restaurant! Never been, but have always meant to go! We enjoy the pleasant ambience at the Gables. It sounds like a lovely restaurant! I’d love to visit it sometime! I am SO DYING to go there!!! My husband and I have been wanting to try the Gables for quite some time! We’d love to win! We’d love to try the restaurant sometime! Would to have dinner with a special someone! I’d love to go here…looks fabulous! I would love to dine here. Pick me. Please! I would love to dine at this Restaurant…hope that I win! I know someone that wants to go here. I love restaurants with a French influence. J’aimerais prendre mon mari dans ce restaurant pour la Saint-Valentin. This place looks amazing…i would love to win and take my honeybunny there to celebrate our Valentine’s Day together after he is finished being on duty! Food looks amazing- would love to try it! I would love to go and try this restaurant! Would love to try out this restaurant! Fingers crossed! I went there for lunch one day only to be disappointed as it was closed for a private party. I’ve heard such great things about The Gables and can’t wait to dine there. Love the landscape in Wyeth country and would love to win a night out there! I wanna try this place, it looks good! What a wonderful way to spend Valentine’s Day: dinner at the lovely Gables! Fingers crossed that I am a winner! My husband and I would LOVE to visit The Gables for our Valentine’s Day dinner put. The menu looks exceptional and delicious! Would love to take my husband out for a wonderful Valentine’s Day dinner. Have never been! Would love to try it. This sounds like the perfect setting for Valentine’s Day, and the food sounds devine!! I would love to try this place. It sounds charming and delicious! I would love to try The Gables! I would love to take my husband to dinner at the Gables! My fiancée and I would love to have a romantic dinner here. Never been – would love to try! I would love to try this place out! Looks fantastic. Was there for my first time last weekend with a girlfriend. Had a Great time! The Sea Bass was delicious! Pick me! This restaurant sounds awesome! I was just thinking what should I do for Valentine’s Day—this would make a nice surprise for my dear ol’ hubby! Yum – Hubby & I would LOVE to eat at this Wonderful restaurant! Hope I win for a romantic dinner for two! We’ve heard the Gables is a lovely restaurant..Always excellent food and service! Would love to dine with you! Always great at the Restaurant festival! My boyfriend and I would love the chance to treat ourselves to a nice dinner after being on a very tight budget this past year after just moving in together! Did I mention we are both HUGE foodies! Pick me, pick me! Would love to check this place out! We live in the area, but have never been to The Gables and can’t wait to try it! This gift certificate would definitely help! Looks lovely. Would love to win this and celebrate a new beginning of my life! Love the Gables. Winner winner chicken dinner. No whammy! Would love to win this prize. The restaurant looks fabulous and I’m sure the food will be scrumptious! This is suppose to be a great restaurant. This is a terrific restaurant and a terrific contest. My birthday is this month so I do hope to win ! I love the Gables the food is amazing and the atmosphere is so quaint! Ohhh, so excited, thank you for the chance!! This would be the perfect place to bring my beautiful wife for a wonderfully romantic Valentines dinner (and drinks! )Thanks for the chance! AMAZING food and atmosphere. I would love the chance for a romantic and unforgettable date night with my husband! visit and visit often! delicious! My beautiful wife and I had our wedding reception here last October. The BEST day of my life! Love, Love, Love The Gables! Pick me! My husband deserves a great night out and I want to treat him to only the best! Love your website! would love to win! Great menu! The Gables. I loved the place and haven’t been in quite some time. The last time I was there, a female bartender was pretty snippy with me and other patrons. I’ve been a bit soured ever since. I could be swayed back to give The Gables another try with a gift certificate/card. Until that happens, though, I remain soured. AML is so great and involved with promoting local businesses. will to win and bring a few guests along. This would be a fantastic introduction to a gorgeous restaurant!!! Would love to dine here! The Gables at Chadds Ford! would be the most perfect, romantic place to spend Valentine’s this year. Yummy food! Love the Gables!! Heard so many great comments about The Gables. Would love to try the food. Romantic setting – and delicious food! Nothing like getting in at the last minute….could really use a night out and the Gables looks amazing. I would be super excited if I won this gift certificate!